Outstanding large wall map of Europe by the famous Dutch cartographer and map publisher Gerard Valk. Printed from six plates and joint together, mounted on linen. 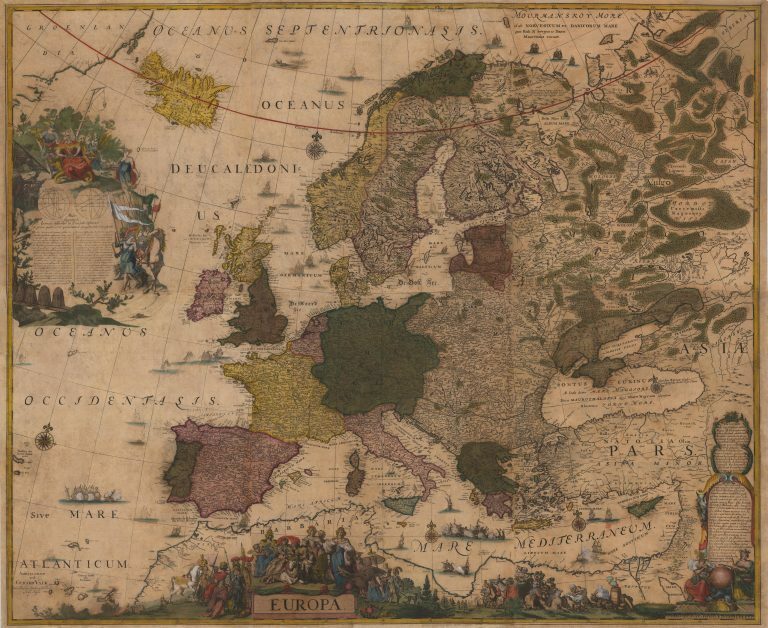 A highly impressive wall map of Europe in original colors as published ca. 1700. Gerard Valk, often in the company of Petrus Schenk was more republishing the work of other cartographers, than making maps by himself. In this case I think he might have used a map of Europe by Frederic as his model, even the same plates, but remade the decorations. Maps of this size are rare. Firstly, because they were issued in less numbers than the maps which typically appeared in books or atlases. Secondly because they did not have the cover of the book to protect them from the elements.